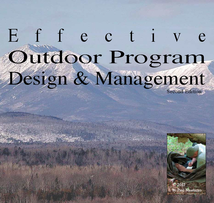 The second edition of Effective Outdoor Program Design & Management (73 pages) is a 8.5 x 9 inch full color booklet is the essential "How To" manual for outdoor program administrators and field staff who are starting a new program, evaluating their current program, and simply want to get the most out of their program and courses. Written in an expanded outline format to facilitate it's use, it accurately describes the programmatic BIG picture (including site management) in words and graphics. A notes section permits you to make comments related to your program or interests beside the related text. Clearer graphics and text highlight this edition. The book is a valuable and practical component to any senior or graduate level risk management seminar. Note that training, mentoring, and critical thinking are required to master the material.